Guitar Mastery Simplified, by Erich Andreas AKA Your Guitar Sage, is packed with the most important guitar lessons that will help you take your guitar playing ability to the highest level it has ever been! Erich has taught/played guitar professionally for almost 30 years. - Exactly "Where to Start?" You will FINALLY get to fully understand guitar music theory while at the same time learn all the important guitar chords needed to become an advanced guitar "ninja". This book is for beginners to advanced guitar players. 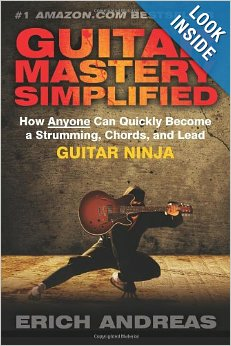 The solutions you'll discover inside Guitar Mastery Simplified will have you on your way to playing the guitar like a true strumming, chords and lead guitar ninja! The guitar lessons inside this book will have you rockin' out to all your favorite guitar jams and songs in no time.